Prepared quick and simple bento for this morning. Didn't want to do so much details for today's bento. I'm still having headache although the fever is going down. Too much fun on Saturday or maybe because too tired for being a host for CNY's Eve Dinner at my home. So excuse me to just put little words for this post. Inside the first box : rice balls, mini oranges. And inside the second box : sweet sour fried shrimps, tamago & baby green bean, chikuwa & asparagus, cherry tomato, chikuwa & sausage. Happy Lunar New Year. Today's bento looks cute and hope you're getting better. Take care! I would love to have this as a breakfast bento. Everything looks so delicious. Super cute boy and girl onigiri, and tiny mandarins, and perfect tamagoyaki! 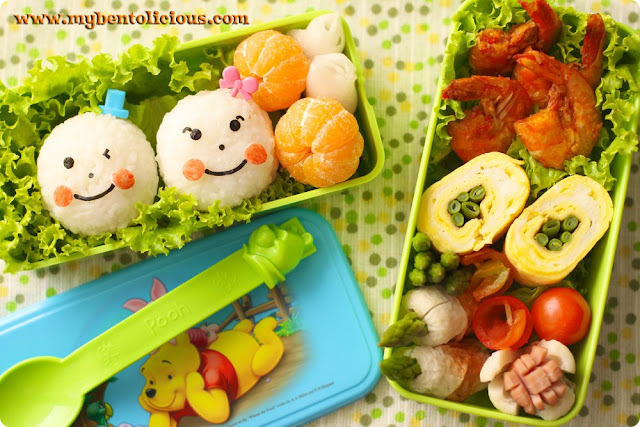 Love your sweet bento once again, so cheery and pretty! Aw... I hope you get fine soon. This bento is lovely and yummy enough as always! @Token : Thanks a lot! @babyskins : Thanks a lot Izumi! @Indonesia-Eats : Thanks a lot Peppy! I hope someday my bento will look like your quick bento! I hope you feel better soon. Hi Lia! I love this bento with the cute rice balls! The shrimp and the tamagoyaki look delicious!!! the faces on the rice balls are so cute! oh no, i'm just reading this now, and i'm sad you were feeling sick. hopefully you are all better now. and take consolation in the fact that even when you're not feeling well your bentos are still ADORABLE (i love the pretty tamago rolls and sausage flower in this one)!